Many people can feel stressed when multiple tasks are placed on them at one time. Stress can be triggered when people feel nervous or frustrated—like that feeling before a job interview or exam. Anxiety is a feeling of unease, worry, or fear. It can also be a reaction from stress. When these emotional reactions become more frequent, chronic stress is also thought to interfere with relationships, school, and work. In a new scientific review published in the journal Current Opinion in Psychiatry, researchers from the Rotman Research Institute at Baycrest Health Sciences warn that people must decrease chronic stress and anxiety or they may increase their risk of depression, and possibly dementia. In the review, the researchers observed areas of the brain impacted by chronic stress, fear, and anxiety from previously published human and animal trials. The study authors found that all three conditions showed an extensive overlap in the brain’s neurocircuitry. As a result, this may explain the link between chronic stress and the development of neuropsychiatric conditions like Alzheimer’s disease and depression. 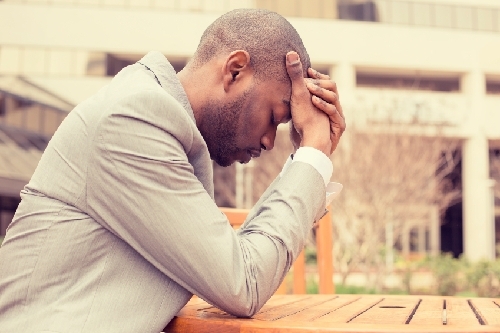 Chronic stress can impair cardiovascular, metabolic, and immune systems. Chronic stress and anxiety are linked with the impairment and structural degeneration of the prefrontal cortex and hippocampus. In turn, this may increase the risk of both depression and dementia. The review also examined neuroimaging trials of anxiety and stress in healthy patients as well as studies of fear and stress in animal models. The researchers specifically looked at brain structures related to anxiety and fear—the hippocampus, medial prefrontal cortex, and amygdala. These areas of the brain are impacted most when exposed to chronic stress. The researchers found similar irregular brain activity with an overactive amygdala and underactive prefrontal cortex and chronic stress, anxiety, and fear. World-renowned depression researcher and neurologist Dr. Helen Mayberg first discovered this relationship between the disturbed brain activity, stress, and emotional disorders 10 years prior. The researchers also commented that stress-induced hippocampus and prefrontal cortex damage is not considered completely permanent. Exercise and antidepressants are thought to increase hippocampus activity. “Looking to the future, we need to do more work to determine whether interventions, such as exercise, mindfulness training and cognitive behavioral therapy, can not only reduce stress but decrease the risk of developing neuropsychiatric disorders,” explained lead author of the review Dr. Linda Mah, who is a clinician scientist with Baycrest Rotman Research Institute. In a previous review published in the American Journal of Geriatric Psychiatry in 2014, the same research team found that anxiety may significantly increase the risk of Alzheimer’s disease in mild cognitive impairment patients. It was the first time that anxiety in mild cognitive impairment patients resulted in a faster decline in cognitive function. Alzheimer’s disease risk increased by 33%, 78%, and 135% in mild, moderate, and severe anxiety, respectively, in mild cognitive impairment patients. Current natural therapies thought to treat stress, anxiety, depression, and Alzheimer’s disease include B complex with B12 vitamins, ashwagandha, kava, fish oil, and dehydroepiandrosterone (DHEA). Mah, L., et al., “Can anxiety damage the brain?” Current Opinion in Psychiatry, 2016; 29(1): 56, doi: 10.1097/YCO.0000000000000223.